For an industrial workstation to be effective, it should be easy to organize, access, and utilize all the items necessary for the job at hand, and it should be adjustable to the specific needs of individual workers. Many industries and different sectors within industries use industrial workstations in order to take physical stress off workers, thereby increasing productivity. 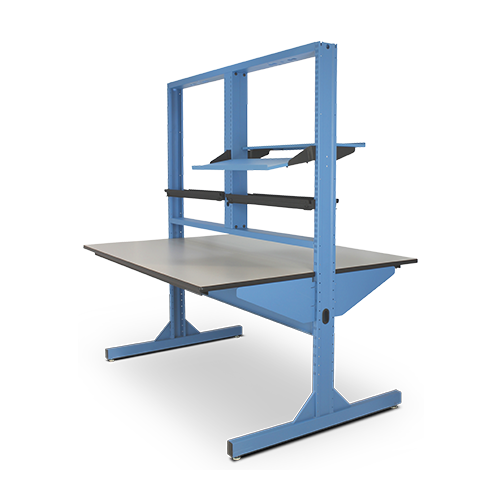 Custom industrial workstations can be portable stations made from lightweight materials, or they may be permanent workstations fabricated from steel or wood, depending on the needs of the industrial job site or garage workshop it is made for. Suitable for use in areas with water, dust, vibrations and wide temperatures are a part of the environment, industrial workstations can be used as clean room tables, light tables, drafting tables, packaging tables, laboratory tables, and more. They can be built for rugged durability and harsh work environments and can be made to fit packing, process control, shipping, factory automation or laboratory requirements. Industrial workstations can be constructed from a variety of materials, yet they must all be able to meet certain standards of strength, durability, and corrosion-resistance. In addition, various components of the workstations are fabricated from differing materials. For instance, the work surface is typically made from a high-density plastic such as polyethylene or an industrial-grade laminate. The work surface then undergoes coating, generally powder coating, for enhances chemical and impact resistance. The undercarriage and legs that support the work surface, however, are often made from metals such as stainless steel due to its extremely high corrosion-resistance. 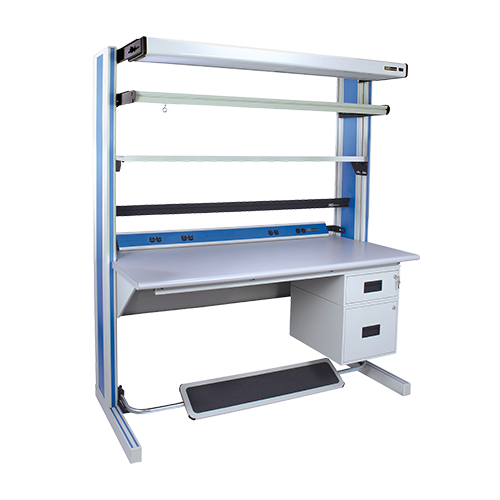 In addition to varying materials, there are multiple types of industrial workstation designs. Ergonomic industrial workstations, for example, are necessary for the safety and health of workers. Aspects such as height, drawer placement, chair height, and cabinet arrangement should be able to adapt to each individual worker so that no extra stress is put on him or her. Customized industrial workstations are widely used to keep workers healthy, injury-free, and productive. They can prevent injury and increase productivity by being adjustable and moveable. Other types of industrial workstations include modular workstations and portable workstations. Industrial Workstations Industrial workstations are used to create efficient spaces in which people can perform a set of specific duties. They create safe environments for the workers and offer productive places for carrying out job tasks.